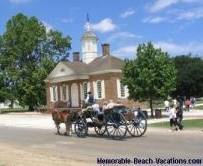 - Pictures & Guide + "Must See's"
The Pictures below are from 3 days of Virginia Beach Attraction Day Trips to Colonial Williamsburg from the Condo on Virginia Beach. This includes an added day when we stayed at a Bed & Breakfast in Williamsburg at the end of our Timeshare Exchange week. Three days is really not enough to see all there is to see at this Educational and Fun Attraction. This is a great Virginia Beach Attraction Day Trip (or trips) for all ages! The drive to Colonial Williamsburg from Virginia Beach is through some scenic forested areas - you may see some beautiful Fall Foliage colors if you are considering that time of year. To: Pictures + Info & Tips - Album 1: Virginia Beach, Boardwalk, and local area Attractions + Reviews and Tips - Includes Cape Henry Lighthouse Pictures. To Pictures + Info & Tips - Album 2: Day Trips - Nearby Virginia Beaches and near Virginia Beach Attraction Pictures + Nearby Family vacation beaches "Reviews" & Tips. Yorktown, Jamestown, and other nearby Historic Areas + Busch Gardens - Williamsburg. Many great area points of interest including historic mansions & plantations, battleground sites, and more. Much to do and see for families or Individuals of all ages! 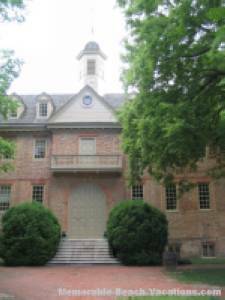 Don't miss the Governors Palace Tour in Colonial Williamsburg! Completed in 1722. A Costumed guide will lead you throughout the Mansion and tell you all the intesting facts and history. Many antiques. Check out the 100's of guns on the walls and on the ceiling in the Foyer! 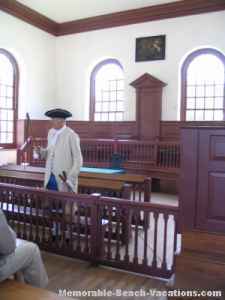 Colonial Williamsburg Courthouse Guide explains how whips were used for punishment in Colonial Days. Allow 2-3 days to see Colonial Williamsburg -- you still won't have seen it all in 3 days! 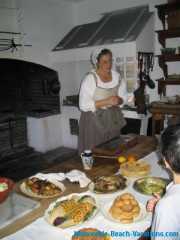 Colonial Williamsburg Kitchen - Cooking the 18th Century way - Still a working Kitchen! Guides tell you how cooking was done back then -- withOUT microwaves or refrigerators! 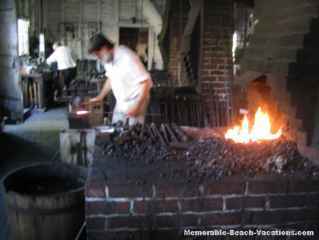 Colonial Williamsburg - Villiage Blacksmith pounding out square nails. Be sure and take in a fun Play in the evening! Melodramer style with a lot of audiance "interaction!" Historic Campus of College of William and Mary - at west end of Colonial Williamsburg - can get to entrance to campus from Colonial Williamsburg or off of Richmond Road in town of Williamsburg. Walk through the Sir Christopher Wren Building - the oldest college building in the US - Constructed between 1695 and 1699. Are other historic campus buildings you can view also. Beautiful campus. (Check out the tiny brass door knobs on the massive wooden doors!) Guided tours available if College is in session - Self guided tour otherwise. No admission fee. Not in Colonial Williamsburg, but just 3 miles east of Williamsburg off of I-64 -- You drive past it going and coming from Virginia Beach to Colonial Williamsburg. Theme park for whole family. Attractive Landscaping with a 17th century European Theme. Voted the world's "Most Beautiful Theme Park" for several years. Over 40 rides including some "serious" roller coasters + 10 Stage shows. We are adding Info, Pictures, and Tips somewhere on this Site almost daily. We are doing our best to ultimately make this site one of your most Interesting, Fun, and "Picture Enhanced" Virginia Beach Attraction Info and Tips Sources. Favorite beaches, Virginia Beach Attractions and places of interest you found interesting or memorable. Send us Your Top Picks and Comments on our Top Picks and Comments Page. Thanks!